Pumpkin spice lattes are back for the season! But, if you find yourself walking up to the counter wondering how to order a healthy coffee drink, we are here to help. UnityPoint Health Dietitian Emma Rueth arms you with coffee nutrition facts to make smarter decisions. Whether you are considering pumpkin spice latte calories or another coffee treat, Rueth suggests staying under the 200 calorie mark with a short or tall order. It will be hard, but she gives these three tips for low calorie coffee drinks. Skip the whip. Cutting out whipped cream will save you 160 calories and six grams of fat. Manage the milk. Ordering low-fat milk or almond milk will decrease overall calories. Skimp on the shots. The flavor shots, that is. If you don’t want to skip them all together, ask the barista for fewer shots (or pumps) of flavored syrup, or choose the sugar-free option. However, sugar substitutes, just like real sweeteners, should be used in moderation. “For the pumpkin spice latte specifically, the healthiest option is to order a tall (12 ounces) skinny pumpkin spice latte (non-fat milk) with no whipped cream,” Rueth says. A word of caution, Rueth says it’s best to limit liquid calories as much as possible. For the general population, she recommends using the tips above and sticking to no more than one specialty coffee drink per week. Rueth says having a pumpkin spice latte with almond milk or soy milk doesn’t automatically make it or any flavored coffee beverage healthier. She says an unsweetened soy milk latte will have a similar amount of calories and protein as a latte with fat-free dairy milk. When considering the unsweetened almond milk latte, it will be about half of the calories, but will not offer protein. In other words, you can choose between lower calories or lower protein. “If your Starbucks drink is your breakfast or snack, choosing a coffee with skim milk will be a great source of quality protein and carbohydrates to help sustain you until your next nourishing meal,” Rueth says. If you are choosing your drink by the caffeine content, Rueth suggests skipping the pumpkin spice latte and going for an Americano. Rueth explains how at Starbucks, most lattes contain two shots of espresso in 12-20 ounce drinks and three shots in a bigger, 24 ounce drink. Starbuck’s Americanos (espresso mixed with water) contain two shots of espresso in a 12 ounce drink, three shots in a 16 ounce and four shots in a 20-24 ounce Americano. Four shots of espresso are about 300 mg of caffeine. “Choosing a grande (16 ounces) or venti (20 ounces) Americano will provide more caffeine than choosing a larger size of your favorite latte. Keep in mind, this will also save you calories from added sugar and fat in your latte, even if you choose to add one to two tablespoons of half and half to your Americano,” Rueth says. Rueth says adults should be able to safely consume 300 to 400 milligrams (mg) of caffeine per day. However, talk to your provider about what’s best for your health. If you have your heart and mind set on the pumpkin spice latte, there is a way to keep coffee nutrition facts in mind and make it healthier. “You can easily make yourself a delicious, healthy homemade pumpkin spice latte. Using real pumpkin and limiting the amount of added sugar in your drink can make your pumpkin spice latte a perfectly healthy option!” Rueth says. While Starbucks pumpkin spice lattes and McDonald's pumpkin spice lattes contain a very minimal amount of pumpkin puree, you can mix in a bit more to increase the nutritional benefits. “Pumpkin is a great source of several vitamins and minerals, like vitamin A and potassium. The vitamin A in pumpkin comes in the form of beta-carotene, which our body uses for eye and skin health. Potassium helps with blood pressure regulation. Pumpkin is also a fantastic source of fiber, which is an essential nutrient which can reduce your risk of type 2 diabetes, high blood pressure, heart disease and certain cancers,” Rueth says. The actual coffee in your drink also adds to the benefit of your healthy pumpkin spice latte. Rueth says freshly ground coffee is a good source of antioxidants, as well as small amounts of vitamins and minerals. 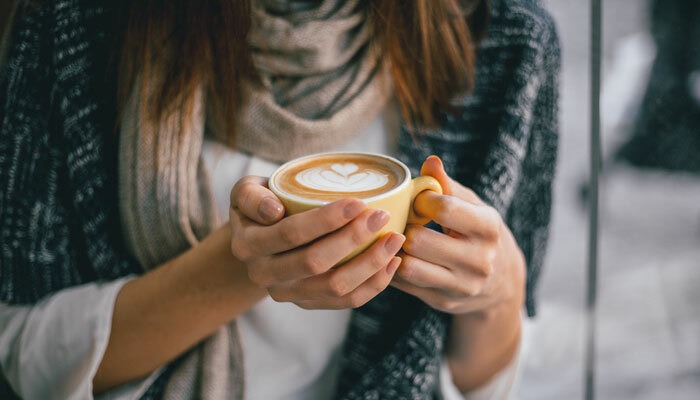 “Some nutrition professionals consider coffee to be the largest source of antioxidants for the American diet because of the amount of coffee we drink,” Rueth says. The caffeine also can boost cognitive function and coffee is an excellent carrier for milk, which adds calcium and protein to the diet. You can find how to make a healthy pumpkin spice latte below. Brew your coffee and keep warm. In a small saucepan over medium heat, whisk together pumpkin, vanilla, maple syrup, pumpkin pie spice and milk. Whisk mixture constantly and briskly, until steaming and frothy. Do not bring to a boil. Pour coffee and pumpkin mixture into large coffee mug and enjoy!